On Wednesday, October 3rd, 2018, Linden Lab officially announced the opening up of EEP testing to Second Life users. Gives region and parcel owners the ability to define the environment (sky, sun, moon, clouds, water settings) at the parcel level. Provides new environment asset types (Sky, Water, Day) – referred to as “settings” – that can be created in the viewer, stored in inventory and traded through the Marketplace / exchanged with other users. 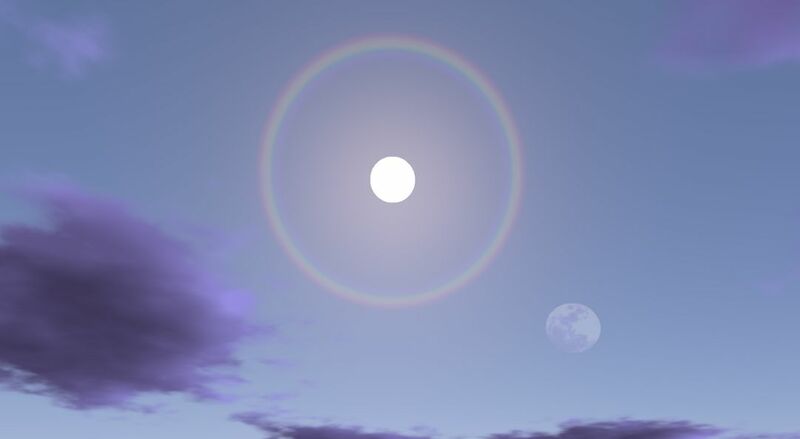 Allows the Sun, Moon and Cloud textures to be replaced with custom textures. An extended day cycle, supporting up to 7 days a week and 24-hour day / night cycles. And that’s just to start. The project will also include rendering updates to allow for atmospheric effects such as crepuscular rays (“God rays”), plus scripted and experience support for the new environment asset types (e.g. assign specific environment settings to an experience, which all participants will automatically have applied in their view when visiting the experience). 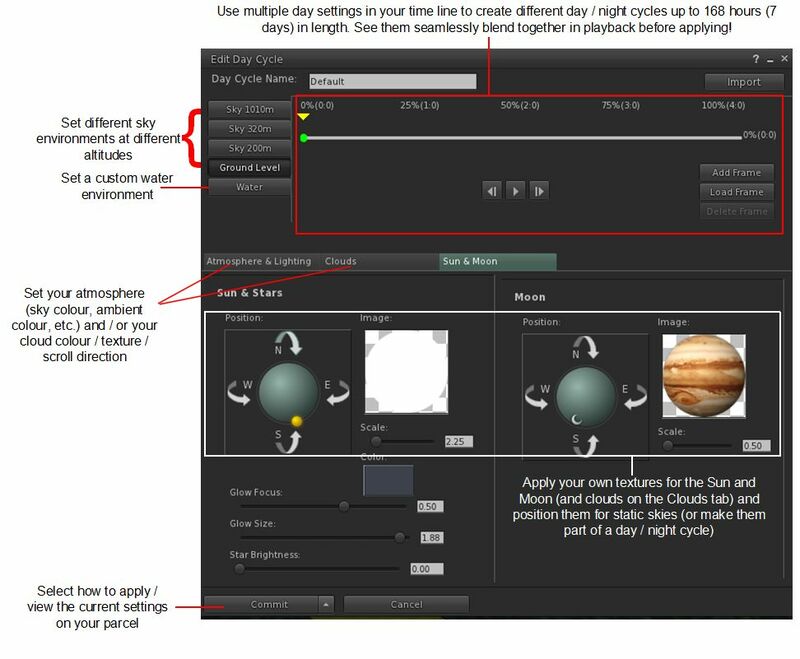 A simple 5-minute (including uploading the textures) demo of replacing the Sun and Moon with Mars and Jupiter respectively, then adjusting their respective sizes & putting them in the same quadrant of the sky. 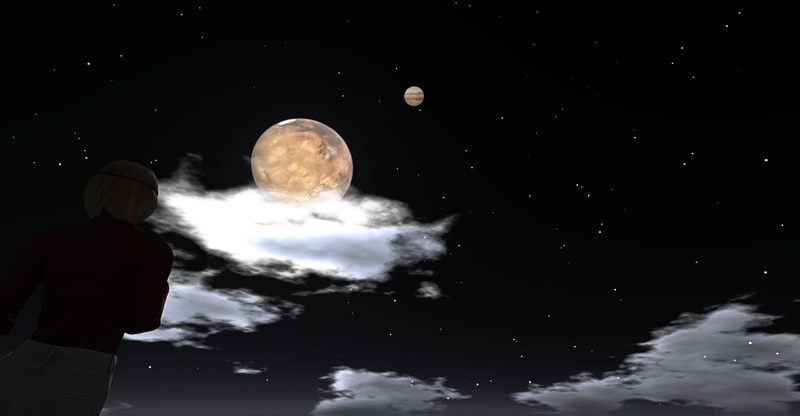 Note the windlight clouds drifting in front of Mars. Testing EEP can only be carried out on Aditi (the beta grid) for the time being, where there is a limited number of parcels available for purchase. Testing can only be carried out using the EEP project viewer. Download the viewer via the Second Life Alternate Viewers Page. At the time of writing, the viewer was version 5.1.10.520121 – but use the above link to get the most recent version. Should you opt to test EEP and find issues, please be sure to raise a bug report, using the [EEP] tag. Reasonably feature requests may also be considered. If you do not successfully purchase a parcel, or wish to see what others are doing with EEP, you can still visit the test region – but you will need to be using the EEP test viewer in order to see anything. I’ll continue to have EEP project news and updates through my Simulator User Group meeting, Content Creation meeting and TPV Developer meeting summaries.